Just four years ago, Google Glass showed us that technology and fashion could be a horrifyingly awkward combination in the wrong hands. Google seems to have atoned for its sins, though, with Levi's Commuter Trucker Jacket with the search giant's Jacquard technology, which lets you control your Android device or iPhone with a few pats and swipes on the left sleeve. After months of quiet hype,the jacket is finally going on sale at select locations this Wednesday, with wider availability opening up next week. In line with previous statements from Google at SXSW last March, The Verge reports that it'll sell for $350 (about £260 / AU$440). Don't expect the Commuter Trucker Jacket to fully replace a wearable device like the Apple Watch for that price. It is chiefly aimed at foot and bike commuters who need rapid information or access to their music without stopping to fumble with their phones, and so the touch-sensitive Jacquard fabric supports only a few gestures that you can set up with an accompanying app. You can brush up or brush down on the sleeve to change musical tracks, for instance, or you can double tap your sleeve to tell Google Maps to set a course for home. Merely holding the fabric makes the whole interface to shut off if you need some quiet. And, yes, you can wash it, so long as you remove the little plastic tag you attach to the cuff before tossing it in the machine. After all, it's basically just a regular $150 Commuter Trucker Jacket from Levi's with Google's Jacquard fabric, but that combination makes it a fun toy and a charming conversation piece. Best of all, unlike with the Google Glass, you probably won't look like a square while wearing it, and that's partly because Google went straight to the source rather than relying on a bunch of techies to create stylish digs. "We don't want to be in the garment business; this is not our place to be," Project Jacquard chief Ivan Poupyrev said when we interviewed him in 2015. "There's a depth of knowledge in these apparel companies that none of us have, because they're spending years and years - in the case of Levi's, hundreds of years - learning." 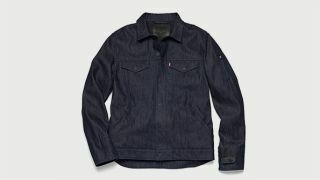 You can pick up the jacket in a few select Levi's stores beginning Wednesday, September 27, or you can wait until October 2 to pick one up on Levi.com.